Retailing giant Marks and Spencer has reported a fall in sales over the key Christmas trading period, adding to signs of slower UK consumer spending. UK like-for-like sales fell 2.2% in the last three months of 2007, its worst performance for more than two years. Sales of clothes and homeware declined 3.2%, while food sales dropped 1.5%. M&S said trading conditions would remain tough in 2008. The news pushed the retailer's shares down 18.7% to 409.25p at close of trade. Earlier in the day M&S shares had hovered around 401p - approaching the 400p-per-share level which retail billionaire Philip Green said he would pay for the firm in mid-2004. BBC business editor Robert Peston said this was "potentially pretty embarrassing" for Sir Stuart and the M&S board, given they had rebuffed his approach and how much they had subsequently spent on modernising the stores and advertising. 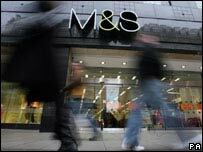 But M&S chief executive Sir Stuart Rose insisted he was unconcerned by the falling share price. He said he was "unfazed by what the market thinks", and added that he wouldn't be selling any of his M&S shares. In fact, it was revealed later in the day that Sir Stuart spent over £1m to buy 250,000 M&S shares at a price of 410.66p a share - bringing his total shareholding to 750,416 shares. M&S chairman Lord Burns also bought 24,316 shares at 411.25p a share - bringing his total shareholding to 46,543. Other retailers have also suffered weak Christmas sales, indicating that consumers are cutting back their spending. On Monday, the British Retail Consortium said UK retailers had seen the slowest sales growth in December for three years, with sales up by just 0.3% year-on-year. Sir Stuart told the BBC that the UK High Street had "definitely slowed up" and conditions in the clothing market were tougher than they had been for 10 years. Prices on clothing and home products were down 6% against a year ago, although Sir Stuart said that M&S had not cut its prices in the run-up to Christmas. He added that stock levels were well controlled and the company had seen a "strong" start to the Christmas sale. Website sales were particularly healthy, up 78%, and, in contrast to its poor results at home, M&S's international sales rose 15.1%. Looking ahead, the firm said its plan to update its stores had been applied to 70% of its shops, adding that a "strong pipeline of new space for 2008 and beyond" was planned. The disappointing news from M&S had a knock-on effect on other retailers, with shares in companies such as Next, Debenhams and Argos-owner Home Retail Group all trading lower. "When a flagship general retailer has a dreadful performance in the third quarter then it does not augur well for other general retailers," said Stephen Pope from Cantor Fitzgerald. However, Robert Peston said there were still reasons for hope at M&S despite latest results. "Marks hasn't yet resorted to the kind of savage price-discounting we are seeing from its rivals. So it has ammunition in reserve". He added that it has the "best property portfolio on the High Street" making it more resilient than most for a deteriorating economic climate.